The Tennis Bubble will be coming down this week, and court space will be limited during this time. Please reference Yourcourts.com for up-to-date court availability. If the bubble comes down faster than planned, we will make sure to open up courts 1-3 on Yourcourts.com when they become available. Please complete the online application before attending either of these dates. And if you have any questions, please email Titan Pools, Inc. directly at info@titanpools.org. We offer a variety of instructional, social, and competitive tennis programs for players of all ages and skill levels. There's something for everyone! 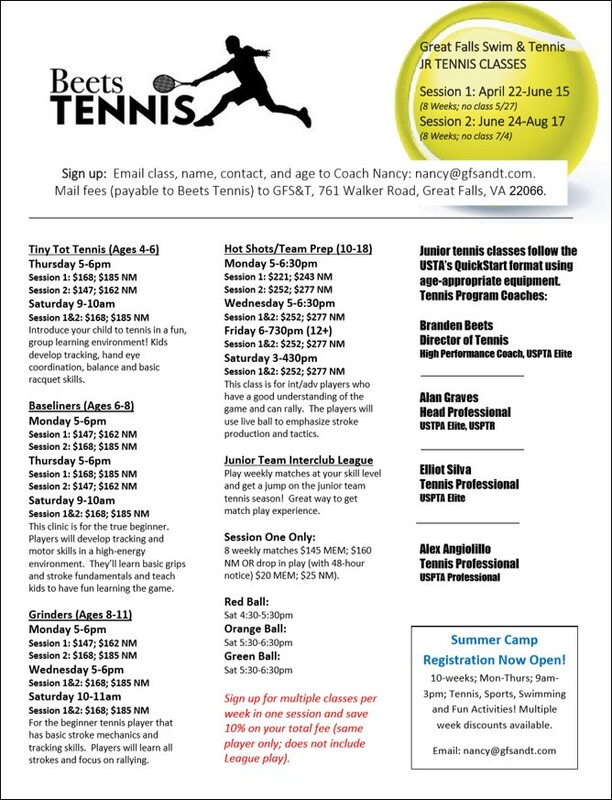 Click on the flyers below to visit our tennis pages on www.gfsandt.com. Come out and play round robin doubles with fellow teammates! Great way to meet players and learn more about playing on the team for GFS&T. Meet at courts 1-3 at 10am on Saturday, April 27th. Enjoy food and drinks afterwards on the patio. We've scheduled the Rapids kick-off meeting for Sunday, May 5, at 5:00pm. The meeting will take place at Team Rep Robin Merrill’s house, located at 934 Welham Green Road, Great Falls VA 22066. - Our new coaches, Coach Jay Wareham and Coach Jason Cochrane, will be in attendance! They are excited to meet everyone! - We’ll have this season's Rapids swimsuit to try on and purchase, as well as samples of Rapids spirit wear for viewing. - And last but not least, Robin Merrill will assist anyone interested in registering. Speaking of registering, Online Registration is OPEN for Swim team (including Mini Rapids! ), Dive team, or both teams. You’re also able to buy Rapids Spirit wear. Hope to see you at the kick-off meeting! Refreshments will be served. Join us for a night of celebration as we open the pool for the 2019 season! Enjoy live music and the company of friends & family at the pool AND on the tennis courts! We will have food trucks available, as well as the snack bar open. So bring a cooler if you'd like, and come enjoy the Club! Tennis friends - don't forget to come play in our Adult Tennis Mixer on the courts with the coaches! It starts at 7:30pm, but come early and enjoy dinner & music at the pool! This adult only event is free to members / $10 per guest. No reservation needed... come on by! It's our annual party to kick off the official summer season. We hope you'll join us for a BBQ complete with food and drinks, a DJ and games, and lots of family fun at the pool! Wine tasting with Classic Wines of Great Falls! The wine tasting will be hosted on the Green Beach Patio, and the pool will be open to kids and adults. Sign up in advance to eat at the club and enjoy some music at the pool! email Jennifer at jennifer@gfsandt.com to reserve your burgers! Children ages 5-10 are invited to join us for a week filled with swimming, tennis, games, fitness, crafts, science and special activities. To register, and for more information, check out our Summer Youth Camp! Pool closes at 4:00pm for our home swim meet. We will bring them TO YOU at the pool! But you have to RSVP in advance to Jennifer by email at jennifer@gfsandt.com. We will have some fun prize giveaways and kids music on the speakers. There will also be a drawing contest for kids at the pool! Bring your pool floats and enjoy a soda float! Home A Meet vs. Sully Station. Home A Meet vs. Brandywine. Wear your best Wimbledon whites and come ready to toast to the finals! We will play some tennis, enjoy light refreshments, and root for our favorite players. We'll be in the club house and on the courts. Please RSVP so we know how many people to expect. Come party at the pool before school is back in session! Music, an inflatable slide, and complimentary snow cones! Visit the food truck for dinner for the whole family! Close out the summer with a bang! It's our last pool party of the season and a great time to relax and catch up with your friends after a busy summer! Mookies BBQ, Drinks, Music, and an Inflatable Slide! Bring your sweet pooch and let them frolic around in the water! Come enjoy an evening with fellow members, and bring a dish to share! We’ll be providing the drinks and prizes! You don't need a partner to join us, and all levels are welcome! Limited to 18 spots, RSVP below to grab one! Come join us for this "sweet" event (no sweetheart necessary). Bring a nice dish to share and play a few rounds of lovely tennis. We’ll be providing the drinks and prizes! There is "snow" way you can miss this event! Bring a dish to share and come join us for this winter wonderland themed event. We’ll be providing the drinks and prizes. We are hosting a Cookie Exchange Open House on Monday, December 17th from 11:00am-1:00pm inside the Club House. Please bring some cookies to share (or just come help us eat them! ), while we provide the drinks! This is a great time to meet fellow members and get to know the GFS&T staff. Bring along a friend or neighbor who might want to see the club! We look forward to hosting you for this fun event, and can’t wait to enjoy some delicious cookies! Please RSVP below so we know how many people to expect! Enjoy a fun and festive morning of tennis & paddle, and bring a dish or drink to share! Dress in your tackiest holiday gear, because prizes will be given for the best outfits! Our annual member meeting will be held at the Great Falls Library on Monday, November 26th from 7:30-9:30pm. Attend this meeting if you’d like to learn about projects happening at the Club, review financial plans for the next year, and vote for members joining the Board of Directors. We’ll be providing the drinks and prizes. Come have a drink at the Club, and talk with our current Board of Directors about what it takes to be on the Board and in Club Committees! We'll be voting in six new Board Members in November for 2019, and we’re always accepting new committee members! Wear your best costume (or festive attire) and bring a dish to share! Come play some tennis and paddle tennis - drills with our pros and organized doubles! You don't need a partner to join us, and all levels are welcome! Please RSVP below so we know how many people to expect. Green Beach doors open at 6:30pm, and the movie will start at dusk (around 6:45pm). We welcome you to bring blankets and picnics for this family-friendly evening under the stars! We look forward to seeing everyone out on Friday, October 19th! Loved your time at the club this summer? Continue the fun by learning to play paddle tennis and joining your fellow club members on the court! Our coaches are hosting a free Learn to Play event for all club members who are new to the sport. It's a great chance to try it, and learn about our events on the paddle tennis court! To join this free, instructor-led activity, please RSVP below. An RSVP is required so we can provide a proper ratio of instructors to players. Loved your time at the club this summer? Continue the fun by learning to play tennis and joining your fellow club members on the courts! Just in time for our indoor tennis bubble to go up....our coaches are hosting a free Learn to Play event for all club members who are new to the sport. It's a great time to test your skill, give your kids a chance to try it, and learn about our fall tennis programs, events, and workouts on the tennis courts! Saturday night we will host a player’s party and pro-exhibition from 6-9pm to celebrate our winners! Food & Drinks provided for all attending. Please RSVP below so we know how many to expect. Please note, only Dogs are allowed in the water during this event. Come out and enjoy a boot camp workout on the Green Beach, hosted by Jennifer from Elite Fitness! All levels of fitness are welcome! This hour long session keeps you body guessing with different combinations of a variety of workouts. Cardio, strength, endurance, core, balance and fun are all included. While we can host an unlimited number of people up on the Green Beach, please RSVP below so we know how many people to expect for this session. Bring your sweet pooch and let them frolick around in the water! Pull up a raft (or a towel, or a chair) and enjoy a movie at the pool. Movie will start at 8:00pm. Snack Bar will be open. Bring a dish to share and BYOB. Come play some tennis - drills with our pros and organized doubles! You don't need a partner to join us, and all levels are welcome! Come party at the pool before school is back in session! Music, an inflatable slide, and complimentary snow cones & drinks. Visit the food truck for dinner for the whole family! Free to members, $5 for each member's guest. The 2018 Club Championships are open to all club members and all playing levels. Get in the action! Winners receive their name on the championship trophy and recognition at the finals event.